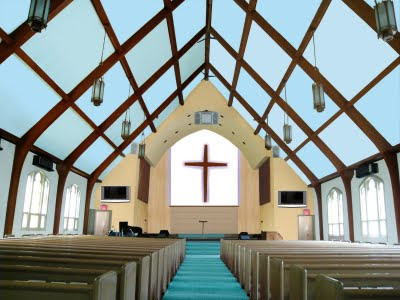 I was retained to lift the spirits of the congregation and change the color of this space. Nothing had been done to the actual church's windows, walls or ceilings for a very long time. My approach was to use color to speak to what happens in that space - my goal was for the congregation to have a heavenly experience. It's not everyday that you have an opportunity to do this type of work in this type of space. I look for inspiration everywhere - for space I found a photo of a wrought iron gate and a sail boat. I sketched the space and developed a color palate. Some of the colors I chose were Skylark and Picture Perfect Blue combined with French Vanilla and Iris, all from the Benjamin Moore line. Ultimately, this has to be a place of peace and calm and I thought that these colors really achieved that. It's a respite, a place where the congregation can escape - but really, a space of worship means so many different things to so many people. I chose colors to support a feeling of enlightenment and euphoria - something color can do so well. I am inspired by everything around me - combined with the hopeful feeling of the people who hired me. I had come highly recommended by a member of the congregation who had experienced what I had done in another house of worship - and to me, that is a wonderful gift. A design that inspired someone to reconnect with me for a new project is always a compliment. As the creative force between the technical drawing and the spirit of the design, I often translate through color. In the case of this church, I applied what I call 'architectural coloring'. 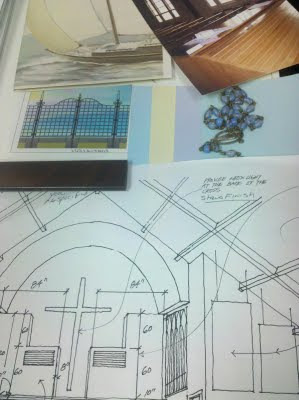 I enhance the architecture through coloring...and a space like this enhances the lives of those who worship in it.